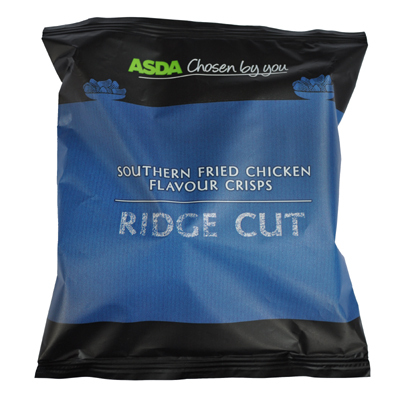 The largest Crisp in a bag full of large Crisps, took a hefty bite to split it into edible sections. The following munches degraded into mush at a reasonable pace. There did not seem to be that many Crisps in the test bag, but that was because there were four giant Crisps in there. The rest, making up the 25g, were mostly whole as well. The Crisps were gently curled and thickly cut. The ripples were evenly spaced and medium width cut. Although predominantly yellow in colour, there was some darker yellow; almost orange coloured seasoning and a few specks of black pepper looking flecks. There was a fried something or other smell when the bag was opened, but The Nose Plunge Test could not be accurate enough to suggest that it was Fried Chicken. Although Chicken flavoured Crisps generally taste of Chicken stock rather than Chicken itself, these certainly hinted towards the flavour description on the bag. They also had a nice, and somewhat surprising pepper underlay, which was not mentioned on the bag. If the Pepper was the attempt at making it a 'Southern Fried' example of Chicken flavour it certainly added an enjoyable extra even if it did not particularly have anything to do with the described seasoning.